Resting stage, birdbath, Northampton, UK, BF image.. 04 Jun 2012. © C.F.Carter (chris.carter@6cvw.freeuk.com). Motile stage, bird bath, Northampton, UK. BF image.. 04 Jun 2012. © C.F.Carter (chris.carter@6cvw.freeuk.com). India. Sathi Ravi Kanth Reddy. © Sathi Ravi Kanth Reddy. Bainbridge Island, Washington, USA: birdbath, cyst. 07 Apr 2008. Karl Bruun. © Karl Bruun (skogenman@earthlink.net). Bainbridge Island, Washington, USA: birdbath. 07 Apr 2008. Karl Bruun. © Karl Bruun (skogenman@earthlink.net). Published in: Flotow, J. von (1844). Beobachtungen über Haematococcus pluvialis. Verhandlungen der Kaiserlichen Leopoldinisch-Carolinischen Deutschen Akademie der Naturforscher 12(Abt. 2): 413-606, 3 pls. 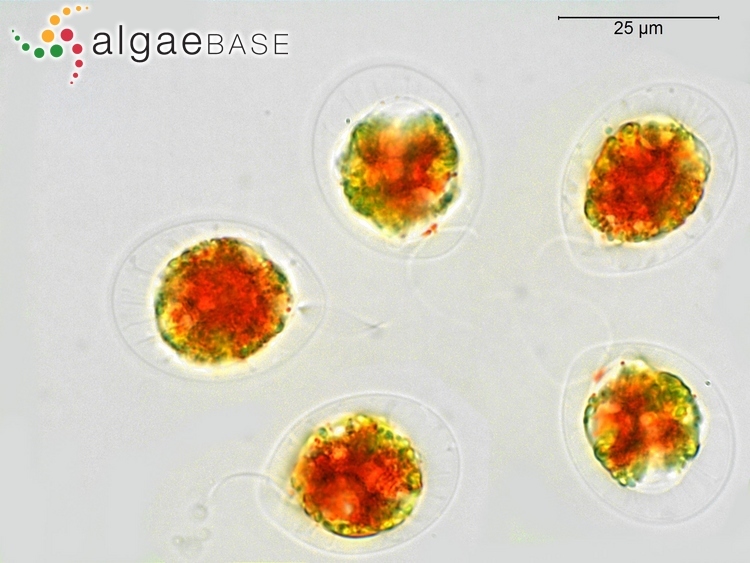 This is the type species (lectotype) of the genus Haematococcus. Adjective (Latin), produced by rain. emend Wille 1903 (Pentecost in John et al. 2002: 319). Allewaert, C.C., Vanormelingen, P., Pröschold, T., Gómez, P.I., González, M.A., Bilcke, G., D'Hondt, S. & Vyverman W. (2015). Species diversity in European Haematococcus pluvialis (Chlorophyceae, Volvocales). Phycologia 54(6): 583-598. Pegg, C., Wolf, M., Alanagreh, L., Portman, R. & Buchheim, M.A. (2015). Morphological diversity masks phylogenetic similarity of Ettlia and Haematococcus (Chlorophyceae). Phycologia 54(4): 385-397. Wille, N. (1903). Algologische Notizen IX-XIV. Nyt Magazin for Naturvidenskaberne 41: 89-185. Accesses: This record has been accessed by users 21566 times since it was created. Abomohra, A. E.-F., Sheekh, M.E-S. & Hanelt, D. (2016). Protoplast fusion and genetic recombination between Ochromonas danica (Chrysophyta) and Haematococcus pluvialis (Chlorophyta). Phycologia 55(1): 65-71. Fan, L., Vonshak, A. & Boussiba, S. (1994). Effect of temperature and irradiance on growth of Haematococcus pluvialis (Chlorophyceae). Journal of Phycology 30: 829-833, 6 figs. Fernández Lozano, J., Guillén Oterino, A., Gutierrez Alonso, G., Abel Flores, J. & Pérez Turrado, J. (2015). Presencia de Haematococcus pluvialis (Flotow, 1844) en la provincia de Zamora (Haematococcaceae). Bol. R. Soc. Esp. Hist. Nat. Sec. Biol. 109: 101-107. Flotow, J. von (1844). Beobachtungen über Haematococcus pluvialis. Verhandlungen der Kaiserlichen Leopoldinisch-Carolinischen Deutschen Akademie der Naturforscher 12(Abt. 2): 413-606, 3 pls. Hagen, C., Grünewald, K., Schmidt, S. & Müller, J. (2000). Accumulation of secondary carotenoids in flagellates of Haematococcus pluvialis (Chlorophyta) is accompanied by an increase in per unit chlorophyll productivity of photosynthesis. European Journal of Phycology 35: 75-82, 5 figs, 2 tables. Han, D., Wang, J., Sommerfeld, M. & Hu, Q. (2012). Susceptibility and protective mechanisms of motile and non motile cells of Haematococcus pluvialis (Chlorophyceae) to photooxidative stress. Journal of Phycology 48(3): 693-705. Kathiresan, S., Chandrashekar, A., Ravishankar, G.A. & Sarada, R. (2009). Agrobacterium-mediated transformation in the green alga Haematococcus pluvialis (Chlorophyceae, Volvocales). Journal of Phycology 45(3): 642-649, 6 figs, 3 tables. Kim, Z.-H., Lee, H.-S. & Lee, C.-G. (2009). 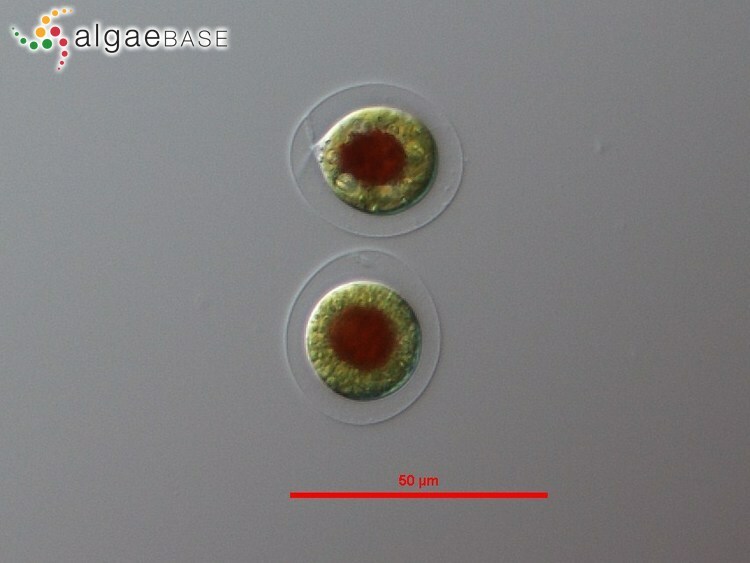 Red and blue photons can enhance the production of astaxanthin from Haematococcus pluvialis. Algae 24(2): 121-127, 4 figs, 2 tables. Klochkova, T.A., Kwak, M.S., Han, J.W., Motomura, T., Nagasato, C. & Kim, G.H. (2013). 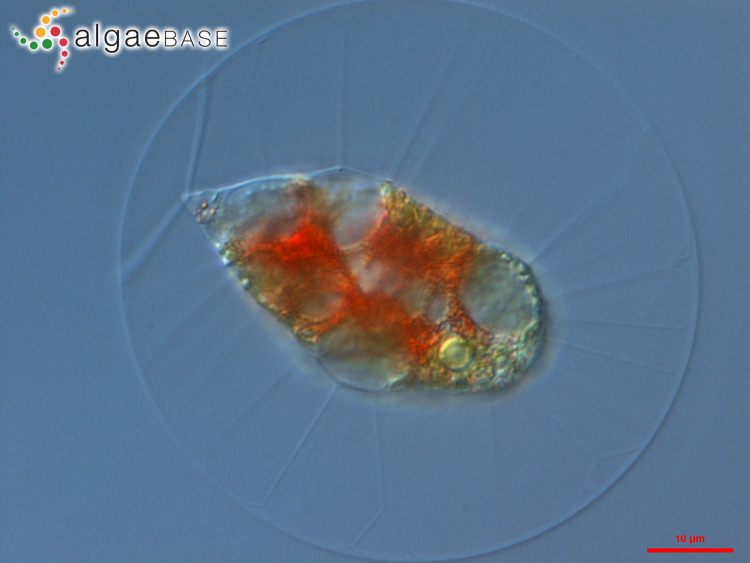 Cold-tolerant strain of Haematococcus pluvialis (Haematococcaceae, Chlorophyta) from Blomstrandhalvoya (Svalbard). Algae. An International Journal of Algal Research 28 (2): 185-192. Liu, J., Chen, J., Chen, Z., Qin, S. & Huang, Q. (2016). Isolation and characterization of astaxanthin-hyperproducing mutants of Haematococcus pluvialis (Chlorophyceae) produced by dielectric barrier discharge plasm. Phycologia 55(6): 650-658. Meng, C., Liang, C.W., Su, Z.L., Qin, S. & Tseng, C.K. (2006). There are two 5'-flanking regions of bkt encoding beta-carotene ketolase in Haematococcus pluvialis. Phycologia 45: 218-224. Nogami, S., Ohnuki, S. & Ohya, Y. (2014). Hyperspectral imaging techniques for the characterization of Haematococcus pluvialis (Chlorophyceae). Journal of Phycology 50(5): 939-947. Peled, E., Pick, U., Zarka, A., Shimoni, E., Leu, S. & Boussiba, A.S. (2012). Light-induced oil globule migration in Haematococcus pluvialis (Chlorophyceae). Journal of Phycology 48(5): 1209-1219. Pringsheim, E.G. (1951). Smärre uppsatser och meddelanden. Haematococcus droebakensis und Stephanosphaera pluvialis am Erken-See in Schweden. Botaniska Notiser : . Qiu, B. & Li, Y. (2005). Photosynthetic acclimation and photoprotective mechanism of Haematococcus pluvialis (Chlorophyceae) during the accumulation of secondary carotenoids at elevated irradiation. Phycologia 117-126: . Reinecke, D.L., Zarka, A., Leu, S. & Boussiba, S. (2016). Cloning, molecular characterization, and phylogeny of two evolutionary distinct glutamine synthetase isoforms in the green microalga Haematococcus pluvialis (Chlorophyceae). Journal of Phycology 52(6): 961-972. Rioboo, C. Gonzalez-Barreiro, O., Abalde, J. & Cid, A. (2011). Flow cytometric analysis of the encystment process induced by paraquat exposure in Haematococcus pluvialis (Chlorophyceae). European Journal of Phycology 46(2): 89-97. Tan, S., Cunningham, F.X., Jr, Youmans, M., Grabowski, B., Sun, Z. & Gantt, E. (1995). Cytochrome f loss in astaxanthin-accumulating red cells of Haematococcus pluvialis (Chlorophyceae): comparison of photosynthetic activity, photosynthetic enzymes, and thylakoid membrane polypeptides in red and green cells. Journal of Phycology 31: 897-905, 6 figs, 1 table. Torzillo, G., Göksan, T., Isik, O. & Gökpinar, S. (2005). Photon irradiance required to support optimal growth and interrelations between irradiance and pigment composition in the green alga Haematococcus pluvialis. European Journal of Phycology 40: 233-240. Triki, A., Maillard, P. & Gudin, C. (1997). 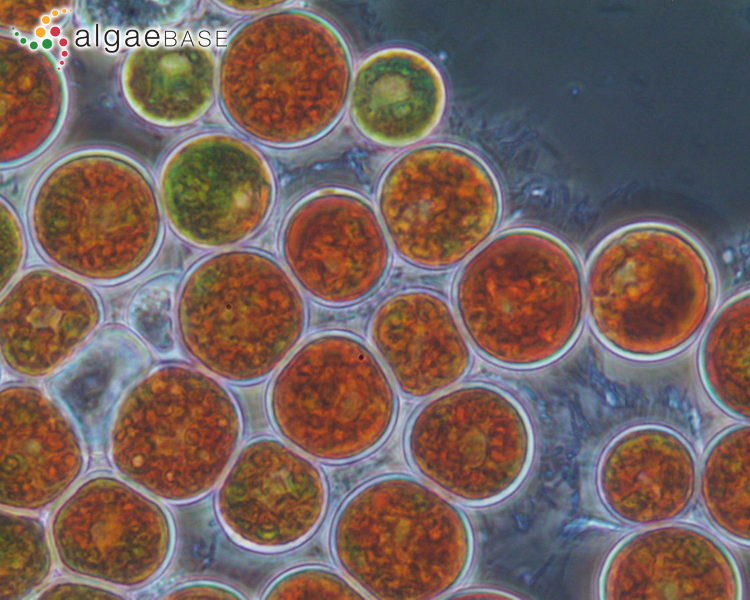 Gametogenesis in Haematococcus pluvialis Flotow (Volvocales, Chlorophyta). Phycologia 36: 190-194, 8 figs, 1 table. Wang, B., Zarka, A., Trebst, A. & Boussiba, S. (2003). 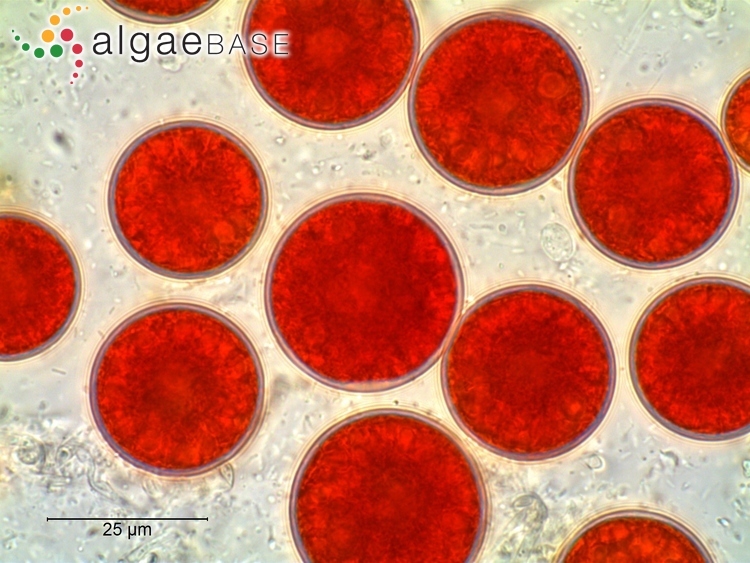 Astaxanthin accumulation in Haematococcus pluvialis (Chlorophyceae) as an active photoprotective process under high irradiance. Journal of Phycology 39: 1116-1124. Wang, J., Sommerfeld, M.R., Lu, C. & Hu, Q. (2013). Combined effect of initial biomass density and nitrogen concentration on growth and astaxanthin production of Haematococcus pluvialis (Chlorophyta) in outdoor cultivation. Algae. An International Journal of Algal Research 28(2): 193-202. Zhekiseva, M., Boussiba, S., Khozin-Goldberg, I., Zarka, A. & Cohen, Z. (2002). 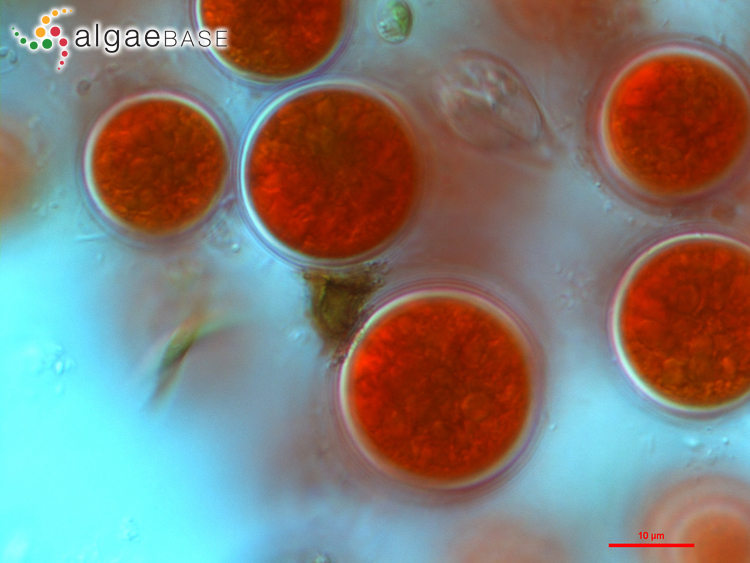 Accumulation of oleic acid in Haematococcus pluvialis (Chlorophyceae) under nitrogen starvation or high light is correlated with that of astaxanthin esters. Journal of Phycology 38: 325-331. Zhekisheva, M., Zarka, A., Khozin-Goldberg, I., Cohen, Z. & Boussiba, S. (2005). 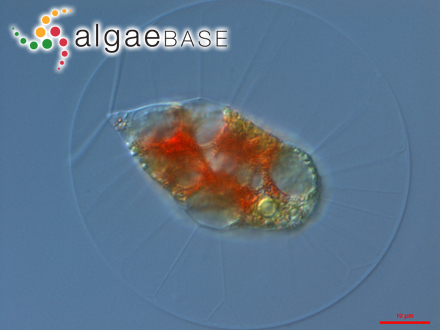 Inhibition of astaxanthin synthesis under high radiance does not abolish triacylglycerol accumulation in the green alga Haematococcus pluvialis (Chlorophyceae). Journal of Phycology 41: 819-826. Zlotnik (Schmerler), I., Sukenik, A. & Dubinsky, Z. (1993). Physiological and photosynthetic changes during the formation of red aplanospores in the chlorophyte Haematococcus pluvialis. Journal of Phycology 29: 463 -469, 1 fig, 2 tables.